January is often the month that we start exercising, start eating clean, and getting our health back on track! Sometime it is very hard to eat healthy when it just doesn’t taste as good! But have no fear, I have created a healthy AND delicious breakfast recipe that will not only keep you full before lunch, but it is also great to get rid of those nasty toxins in our body! Dandelions are literally everywhere during the summer months and most of the time,(no comma) we dig these weeds out and get rid of them. But did you know that dandelions have been used in Chinese medicine to heal and detoxify the body for many centuries? In traditional Chinese medicine, it is believed that we need to balance our bodies with the hot and the cold (Yin and Yang). You usually balance this with the foods that you consume. So for example, if a doctor thinks your body is “too hot,” they may suggest to eat foods that will cool you down and vice versa. Some examples of cooling foods are celery, lettuce, milk and lemon. And some warming foods include ginger, beef, beans and coffee. Having too many foods on either of the spectrum can cause imbalance. After December, aka the month of sweets and non-stop eating, we all need a little detoxification! I love Rishi Teas and was actually introduced to this amazing tea company when I used to work at the restaurants in the Toronto airport where they serve their teas. I love Rishi the moment I tried them because not only were all the teas very flavourful, but you can see how the tea leaves are large full leaf, strip rolled, or hand rolled and not just ground to dust. To top it all off, Rishi is primarily organic, direct trade or fair trade certified, GMO free, and a super sustainable company. (I will write a more detailed blog post on how awesome Rishi is in the near future)! They truly take teas to a whole new level! For a tea lover like myself, I am in heaven trying out all their amazing blends! Rishi Tea’s New Look! Celebrating 20 Years! 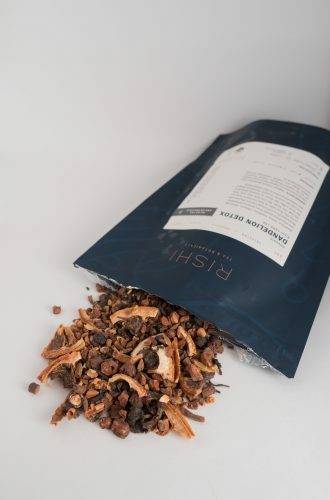 Rishi tea has an amazing Dandelion Detox tea which is an organic pu-erh tea blend. This tea has organic roasted dandelion root, organic lemon pieces, organic lemon peel, organic pu-erh tea, organic oolong tea, organic cinnamon, organic ginger root, organic schizandra berries, and essential geranium oil. When you think of dandelion tea, it is really hard to pin point the taste since we usually don’t go picking dandelions and munch on them! Surprisingly, the roasted dandelion root provides a bittersweet cacao profile and paired with the pu-erh and oolong tea, it gives it a nice nutty smokey flavour. A lot of times people who have tried dandelion teas compare the taste to coffee! 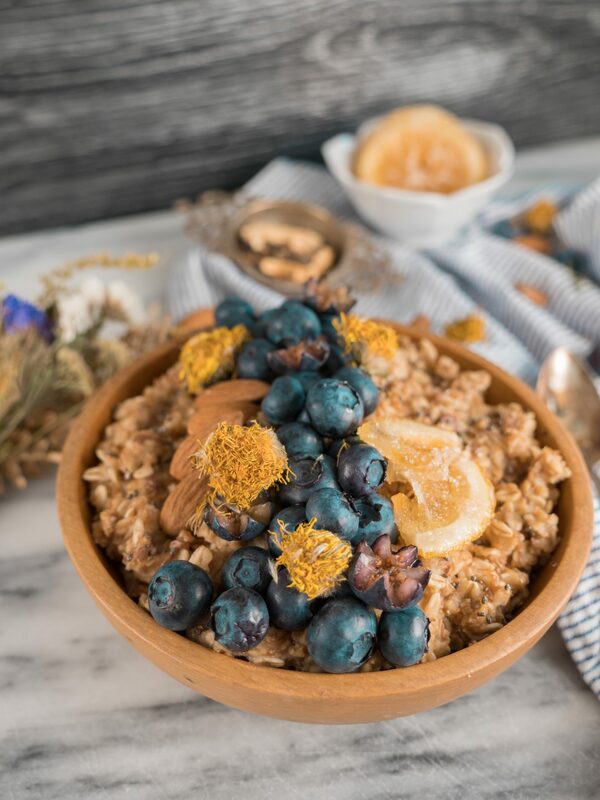 Since dandelion is believed to have such amazing healing powers to detoxify the body, I created a dandelion detox oatmeal that is perfect for your busy mornings! Joyce, this is such a great idea! I drink Dandelion Tea and I eat oatmeal, but I’ve never thought to combine the two! Can’t wait to try this! Thanks. This sounds delicious and very healthy. Dandelion has so many wonderful health benefits. Love this idea. I love Dandelion tea, but I never thought of making oatmeal with it. What a great idea! Definitely trying. 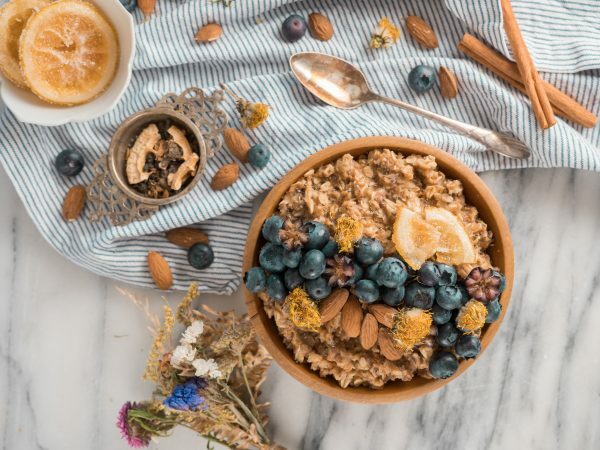 What a unique breakfast recipe, I love it! Dandelion tea is been something I’ve been meaning to try, as I’ve heard of it’s benefits! Loving that it can be fixed into delicious foods like this as well!